Shaolin Baji Quan is one of the excellent routines of Shaolin wushu, its characteristics are imposing, vigorous and fierce, its has six methods of opening such as catching firmly, moving firmly, touching firmly, pressing firmly and bumping firmly, its methods of hand are warding off, getting close, pressing, sticking, twisting, catching, hanging, pounding, picking, lifting, and the methods of leg such as stamping, flicking, kicking, stumbling, hooking, trampling and treading. It is said, "Practicing Taiji can bring peace to the country and exercising Baji can bring stability to the world." 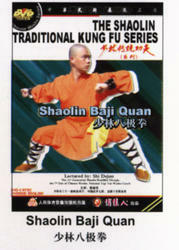 The Baji Quan was created by Lai Lantian, at the 47th year of Kangxi emperor's reign, he came into Song Mountain Shaolin Temple and interchanged wushu skills with two Zen masters, Ru Rong and Ru Lang, and then instructed the Baji Quan to Shaolin monks, after the demonstration from generation by generation, formed the Shaolin Baji Quan.